The Hunterdon County Sheriff’s Office Home Detention Program (HDP) is designed to provide an alternative to incarceration for either a Hunterdon County Superior Court or Municipal Court post-trial defendants. Thus allowing them to continue to pursue employment and/or obtain individual community support programs. 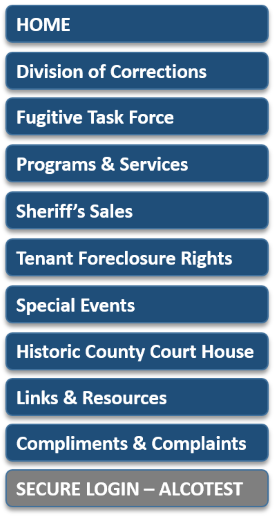 After a defendant is 1) Referred by the Court of Jurisdiction, 2) The Hunterdon County Prosecutor’s Office Designee, and 3) Deemed eligible by the Program Director, the defendant may participate in electronic monitoring via the Home Detention Program (HDP) as an alternative to a Hunterdon County Jail sentence that has been imposed. Participants are monitored 24 hours a day 7 days a week by an electronic bracelet worn on his/her ankle. A monitoring device is also placed in his/her residence. Any unauthorized leave or unauthorized movements alert the monitoring staff. Violations of the program rules result in disqualification from the program and return to Jail. Weekly Drug Screening is required of all participants. Monitoring fees apply but maybe modified by the court. Defendants currently serving a county sentence may contact the HDP Office to request an Initial Interview. 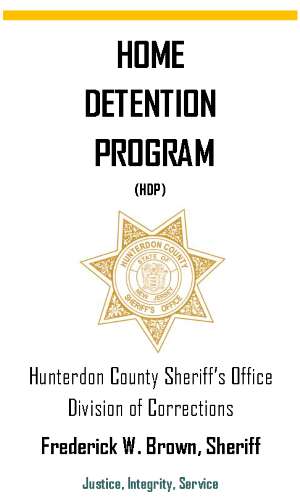 HDP brochures may be downloaded from this site or you may email hchomedetention@co.hunterdon.nj.us for additional information and program requirements.